We were delighted to be a part of the Victoria University Interprofessional Health Education & Practice (IHEP) International Conference earlier this month. One of the biggest discoveries we made was realising that the theory of ‘interprofessional practice’ aligns really nicely with many of the challenges we face as practitioners in the chronic pain rehab community. OK, so what is interprofessional practice? The idea of practicing ‘interprofessionally’ might sound simple enough – it’s the same as ‘multidisciplinary’, right? Well, it’s actually a bit more complex than that. Interprofessional practice isn’t the same as simply working as part of an interdisciplinary or multidisciplinary team or network. Clinicians from different disciplines can all be involved with the same patient at the same time and not actually ever cross paths in any kind of meaningful interprofessional way. In fact, this happens quite a lot. True interprofessional practice sees clinicians from different disciplines not just working alongside one another, but actually learning from one another, reflecting together on progress and collaborating to develop a case formulation and treatment plan. The upshot? The outcomes for patients are generally far greater than any one practitioner could have achieved while working in isolation. The interprofessional practice model is a natural fit for the treatment of chronic illness, but doesn’t fit easily within the constraints of our current health system. To work in a truly interprofessional way, teams need time to plan so that they can develop a common language and framework. For example, we’ve talked before about identifying “flags” or risk factors for long term disability. Naturally, this meeting time with other practitioners is non-billable, so it makes it hard to justify in a private health setting. In addition, once teams start working in an interprofessional way, the boundaries of their respective discipline roles can shift. For example, Physiotherapy session might start with a coffee, to facilitate engagement, followed by gentle exercise and a heavy dose of laughter and story-telling – which helps to down-regulate the stress response. Psychology sessions might move outside of the treatment room to challenge and re-frame a patient’s beliefs (especially in relation to physical movement), meanwhile an Occupational Therapist might encourage their patients to organise a workplace BBQ or re-pot the office plants. All these interventions make sense in the context of increasing function and confidence in real-life situations, however, they don’t always carry much face validity in a traditional hospital setting. For this reason, discipline leaders are especially important in interprofessional teams. Their role is to assist in redefining discipline roles without losing each discipline’s unique perspective, and to role-model effective communication and conflict resolution across the discipline divide. Finally, a key element of practicing interprofessionally is creating regular opportunities to reflect on and review progress and barriers together, so that new insights and treatment pathways can start to emerge. Again, this makes a lot of sense from a treatment perspective, and more and more pain programs are finding innovative ways of including interprofessional reflection and treatment planning – particularly for more complex cases. However, finding a way to legitimately bill (and justify) this time is, again, often a challenge. Well, it was certainly interesting to hear stories from clinicians around the world who have been actively searching for ways to harness the synergy of interprofessional teams to comprehensively identify and deliver patient care initiatives in a time efficient and cost-effective manner. We’ve spoken before about the ongoing review of our primary health care system here in Australia, which offers countless current opportunities for moving in a more interprofessional practice friendly direction (imagine if we had a Medicare code to cover case conferencing, for example). On a final note, it was very heartening to see the extent to which interprofessional practice principles are now becoming firmly embedded in the undergraduate curriculum across all allied health disciplines here in Australia. 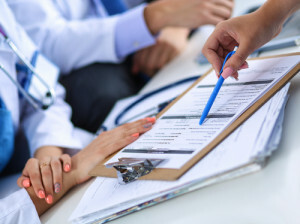 A move that has been driven by the World Health Organisation (WHO), which has released a framework for encouraging interprofessional education and collaborative practice on a global scale – a very promising step in the right direction. Then be the change you want to see! Step out of your discipline ‘silo’ and lead the move toward increased interprofessional collaboration. Don’t know where to start? Why not call a colleague, share a treatment idea and put together a combined case formulation. Check out the WHO Framework for Action for more ideas. Click to read about Victoria University’s Interprofessional Health, Education & Practice International Conference here. Rachel, Steve and the Innovative Rehab team.